The river tunnel of the Tham Xe Bang Fai system contains at least one large bat colony, hanging in a very high ceilling above the river, and thus out of reach. Numbers of skulls found in the river tunnel itself are low, given the size of the cave, since conditions are detrimental to their preservation. Skulls are rarely found, due to the annual flooding, thus the species account given here represents a biased picture. Tham Pha Leusi is the only place where the ground shows a larger accumulation of bat guano, with its associated fauna. Most of the bat records are from here, because conditions to preserve skulls are best here. Tham En has accumulations of old guano, but the cave name points towards swiftlets. Geoffroy’s Rousette is a fruit bat that habitually roosts in caves. It posseses simple echolocation abilities. They were found in the river tunnel of Tham Xe Bang Fai and in Tham Pha Leusi. Other specimens of this genus, which may be either this species or R. leschenaultii were found in Tham Pha Leusi as well. Both rousettes are know to roost together. Theobald's Tomb Bat is distributed from India to Indonesia, though relatively uncommon. It inhabits forested areas and roosts mainly in caves. Large roosts numbering thousands of bats can occur. It was found in Tham Xe Bang Fai. 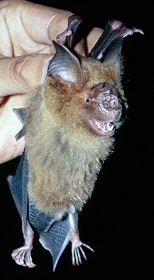 The Great Roundleaf Bat is the largest hipposiderid bat in Asia, it often shares its cave roosts with other bat species. A shared maternity site with Hipposideros pratti is known. This bat ranges from India, Nepal and Southern China to Thailand and the Malay peninsula. Little is known on its ecology. It was found in Tham Xe Bang Fai. The Diadem Roundleaf Bat is one of the most widespread hipposiderid bat, ranging from Myanmar to Australia. It commonly roosts in caves, often in large numbers. It was found in Tham Xe Bang Fai and Tham Pha Leusi. 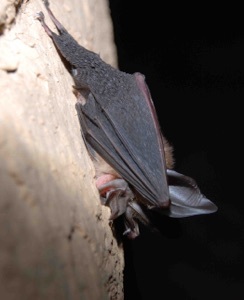 Pratt's Roundleaf Bat is cave roosting bat, which often shares their roosts with other bat species. Caves may contain hundreds or thousands of these bats. Little else is known on the ecology or life history of this species. The known distribution is Southern China and Northern Vietnam. Our record from Tham Pha Leusi may well be the first record from Laos. 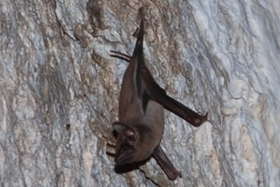 A roundleaf bat from the Grotte des Nuages was identified from photographs. A rhinolophid bat from the Grotte des Nuages was identified from photographs. Remains of other Microchiropteran bats, which didn’t allow identification, were found in Tham Xe Bang Fai and Tham En. There is a large colony of swiftlets in the entrance hall of Tham Xe Bang Fai, which is most probably the German’s Swiftlet. This species, formerly regarded as a synonym of the edible-nest Swiftlet Aerodramus fuciphaga, is widespread along the coast from Hainan/China to Cambodia and Southern Thailand, although inland colonies are rare. The species usually breeds in caves. Frogs, most probably belonging into the Rhacophorus orlovi-complex (Fam. Rhacophoridae) have been photographed in the Grotte des Nuages near a daylight shaft and in Tham Ko Kou Phou. 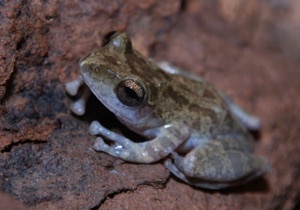 R. orlovi is an epigean species originally described from a karst area in Vietnam, the Phong Nha – Ke Bang National Park. Laos is a country with abundant rivers and large kast areas. It is thus astonishing that only two species of cave fish have been reportet so far. These are Troglocyclocheilus khammouanensis (Fam. Cyprinidae) and Schistura kaysonei (Fam. Balitoridae), both from Khammouan province. During the 2007 expeditions, we collected a white cave fish in a pool in the Grotte des Nuages. In 2008, more specimens from the same pool were collected, and the same species was found in a small pool in Tham Pong. The fishes have been described as a new species (Kottelat & Steiner, 2010), the third known species of cave fish from Laos. It is also the first cave species known in this genus. It is immediately distinguished from all other species of the genus by the absence of eyes and by its whitish colour, both characters obviously related to the cave environment. It is also the smallest known species of the genus, which probably also relates to the limited resources of the cave environment. Nothing else is known of the ecology or behavior of the species. The fish has been observed only in a single residual pool in each cave. This is probably not their primary habitat but the only one where they are accessible to humans. At the time of collecting (in February 2007 and 2008) the Grotte des Nuages was dry, except for a pool where the fishes were collected, a siphon probably connecting to the Xe Bang Fai, and some smaller holes. It seems that the tunnels would be filled by water in the rainy season. The place where the fish were collected is a depression of the passage with very low ceiling, with standing water, about 10 x 25 m long, depth between 0.5 and 1.2 m in the surveyed area, muddy bottom. About 20 fishes were observed, all about the same size. Further specimens were collected from Tham Pong, from a small pool (1.5 x 3 m) in a side passage on the valley side. The bottom is a very deep mud. From the morphology, water probably flows in the tunnel in the rainy season, leaving only residual water when it receeds. These shrimps were collected from the underground part of the Xe Bang Fai. 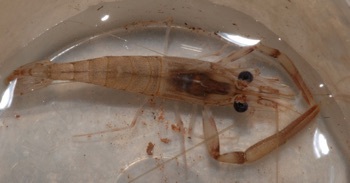 Although several troglobitic Macrobrachium have been described, M. dienbienphuense is an epigean form, which doesn’t come as a surprise, since the river is allochthonous. This species has not been recorded from Laos before, but its occurence there was expected, since it has been found in neighbouring Thailand and Vietnam. Isopods or woodlice have been collected from three of the caves. 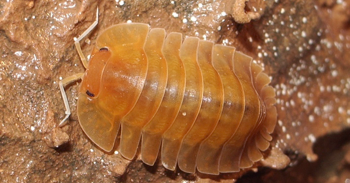 Isopods are characteristic of Lao caves and may have been overlooked in the other caves. The specimens are still awaiting identification. A wide range of insects are found in the caves of the Xe Bang Fai area, as in all caves of Laos. They comprise different beetles, earwigs, cockroaches, flies, mosquitos, mayflies, assassin bugs, ants, moth and crickets. With the exception of the cockroaches, none of them have been identified so far. A character species of all Lao caves, and thus of special interest, are the cave crickets. They are found in almost every cave, most probably feed on fungi growing on guano and all other organic material, and we suppose that they constitute the main prey of all larger predators. Their taxonomy is currently studied at the Russian Academy of Science at St. Petersburg. They probably belong to the genus Diestrammena, and some new species may be expected. Moth larvae of the family Tineidae in caves are usually associated with guano. The larvae build cases as a shelter, which indicate their presence even after the larvae itself is gone. 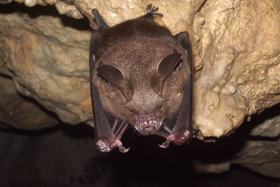 Larval cases were found in guano samples of Tham Pha Leusi, the only cave with larger assemblages of bat guano. The presence of mayflies (order Ephemeroptera) in large numbers are quite unique to Tham Xe Bang Fai. They were common in the midsection of the river tunnel, were they were readily attracted by the caver’s light. Whether their larvae are simply washed into the cave by the river, or whether this is a specific phenomen, whether they are doomed in the cave or able to complete their life cycle is not known. 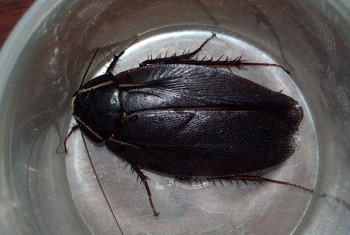 A cockroach collected at Tham Peung, together with specimens from Vietnam, has been described as a new species. The Vietnamese specimens have been collected in the Phong Nha Ke Bang National Park, a karst area renown for its caves, but no habitat has been stated for these. The subfamily Epilamprinae is the most diverse group of the family Blaberidae in South-East Asia. This region is still insufficiently known and new taxa can be expected from there. Cockroaches of the genus Ergaula were found burrowing in the guano of Tham Pha Leusi, at places in large numbers. Species of this genus have been found in guano in caves of Laos, Thailand and Vietnam. Large huntsman spiders of the genus Heteropoda are one of the character species of Lao caves. They are found more or less in every cave which offers some dark and damp places. 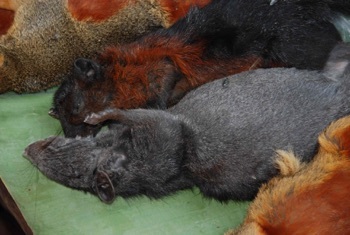 To date, 4 different species have been identified from Lao caves. 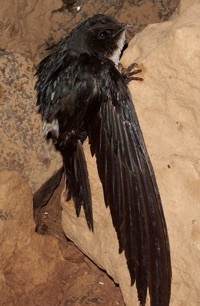 The Xe Bang Fai area caves are unique in Laos for harbouring two sympatric species. Heteropoda maxima (Jäger, 2001) (Fam. Sparassidae). This is the common Heteropoda of Khammouan, probably found in nearly every cave of the province. The first time collected in 1930 by the famous French archelogist Madeleine Colani, it was only described in 2001. With a male leg span of up to 30 cm, it qualifies as the largest spider in the world. Its eyes and pigmentation are developed as in Heteropoda species living outside of caves, though all species were observed and collected exclusively in caves. It has to be classified as troglophil at least. All species were observed and collected exclusively in caves of the Xe Bang Fai area. From all species H. steineri shows the strongest adaptation to a life in caves, which is evident by the eyes reduced in size, the smalles compared to all other Heteropoda species known so far, and by the absence of pigments. It was recorded only in the deepest and darkest sections (midsections) of the large caves in the Xe Bang Fai cave system. 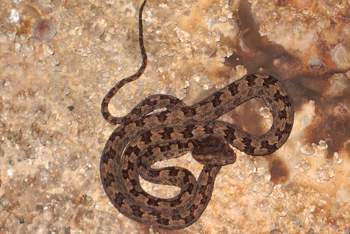 In contrast, H. maxima, which appeared in the Xe Bang Fai cave system, too, was recorded only in the parts relatively close to the entrances (twilight zone, approximately 0–30 m) and far away from the records of H. steineri. Psechridae are poorly studied, the species richness of this genus in South-East Asia was so far misjudged. These spiders were found in caves and also in different habitats outside. In caves, they usually build horizontal webs in niches of the wall, over holes or between rocks. Psechrus species are difficult to catch because the spiders are extremely fast in escaping when somebody approaches the web. It requires some patience or skill to catch them, especially when the retreat is located in a rock crevice. Several new species from caves have been described recently, among them the above one, which is only known from Tham Pha Leusi so far. 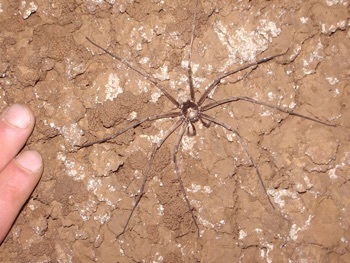 Spiders are quite common in the caves of the Xe Bang Fai area, as in all of Laos. At least seven different taxa from the families Segasteridae, Theridiosomatidae and yet unidentified families were collected. Further five different forms of the family Pholcidae were collected as well. All these still await identification. 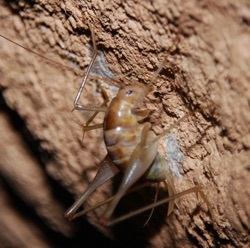 Opiliones or daddy-long-leg spiders are typical for the entrance areas of lao caves, three different taxa were collected in caves of the Xe Bang Fai area, and probably overlooked in the reminder of the caves. Mites were collected from guano samples found in Tham Pha Leusi, the only cave with larger accumulations of bat guano in the area. Three specimens of a small scorpion were collected inside the river tunnel of Tham Xe Bang Fai, about 2 to 3 km from the entrance on alluvial soil and on a sand bank next to the edge of the river. It proved to be a new genus and species belonging into a family which was thought to be monotypic to that date. 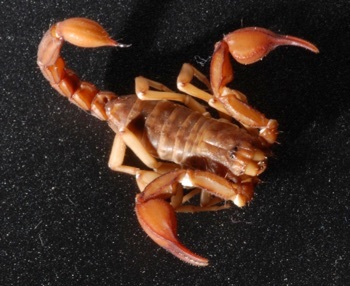 The discovery of the type species of this family, Pseudochactas ovchinnikovi in an isolated mountainous region of southeastern Uzbekistan and southwestern Tajikistan, in Central Asia, was already remarkable, because, this scorpion displays several characters that are unique among recent scorpions, warranting the creation of a new monotypic family, Pseudochactidae. No consensus has been reached yet regarding the phylogenetic position of this enigmatic scorpion. Disagreement exists also on the time this family split from all all other scorpion lineages, opinions ranging from well before the Triassic to Upper Cretaceous and Lower Tertiary times. The disjunct distribution established with this new family member reopens this discussion, because the only possible land connection between Uzbekistan/Tajikistan and Laos is the old Asian core. Although the Palaeozoic history of detachment and collision of these parts is quite speculative, these events took place before the Cretaceous. Nothing is known on the life history or ecology of this species. Interestingly, a third member of this family has been found in the meantime in caves of the Phong Nha-Ke Bang National Park, Vietnam, which is not too far away in direct line from the Xe Bang Fai caves. 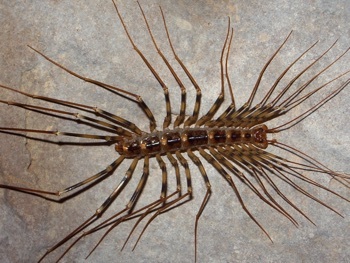 The large scutigerid centipede Thereuopoda longicornis is one of the character species of Lao caves and seen in most karst areas of the country. Small scutigerids collected in Tham Xe Bang Fai and Tham Pha Leusi are probably immature stages of this species. Millipeds are quite common in lao caves, at least two different taxa were collected in Tham Xe Bang Fai, Tham Peung and Tham Pong. A more thorough search will most probably yield millipeds from the other caves of the area as well. 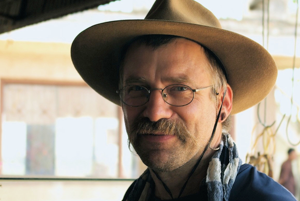 Anisyutkin L.N., 2009. New data on Epilamprinae from Vietnam and Laos (Dictyoptera: Blaberidae). - Zoosystematica Rossica 18 (1): 48-53. Bayer S., Jäger P., 2009. 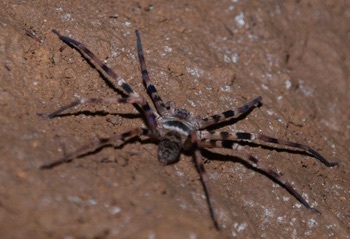 Heteropoda species from limesone caves in Laos (Araneae: Sparassidae: Heteropodinae). - Zootaxa 2143: 1-23. Bayer S., Jäger P., 2010. Expected species richness in the genus Psechrus in Laos (Araneae: Psechridae). - Revue Suisse de Zoologie 117 (1): 57-75. Kottelat M., Steiner H., 2010. Bangana musaei, a new cave fish from central Laos (Teleostei: Cyprinidae). - Ichthyological Exploration of Freshwaters 21 (4): 289-384. Lourenço W.R., 2007. First record of the family Pseudochactidae Gromov (Chelicerata, Scorpiones) from Laos and new biogeographic evidence of a Pangaean palaeodistribution. - Comptes Rendus Biologies 330: 770-777. Vietnam and Laos have been recognized as a hotspot of biodiversity for quite a while. Several of the newly discovered species seem to be associated with karst. The most well-known example is the rock rat Laonastes aenigmamus, others are the Limestone Leaf Warbler Phylloscopus calciatilis, the Bare-faced Bulbul Pycnonotus hualon, the Gymnure Hylomys megalotis, the two rats Saxatilomys paulinae and Tonkinomys daovantieni and the pit viper Triceratolepidophis sieversorum. Although unreported so far, it comes as no surprise that this high biodiversity extends to the cave fauna as well. Tham Xe Bang Fai, one of the greatest river caves in the world, and until recently only known to a few cavers, has entered the limelight of media attention through its coverage by the National Geographic Society. The divers cave fauna of Tham Xe Bang Fai and its associated caves, with several endemic species new to science, has gone unnoticed so far.